We supply a range of greenhouses from several manufacturers including Robinsons, Elite, Halls, Europa Manor, Eden and Juliana. These can be supplied in plain mill finish or powder coated in a variety of colours. We only offer the highest quality of aluminium greenhouse. 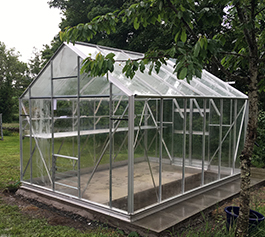 Over our 20 years of experience fitting greenhouses, we have samples all the brands out there so we know exactly who can be trusted and who we recommend for your new greenhouse. Thinking of getting a new Greenhouse but don't know where to begin? Do you know what greenhouse you want? Get a quote from us.